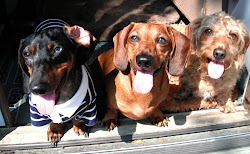 For me I can't understand people who don't like dogs, especially Dachshunds, then you have no sense of humor. I mean you have to admit, they're just funny, just wait 'till you get to know one, it gets better. I mean I do actually understand being fearful of them, I myself had to run the gauntlet everyday to get home from school. I lived at the end of a dead end, then my driveway was another 500 feet long. The neighbors on either side of us both had 2 large German Shepards. I was chased by these dogs on numerous occasions. The last run in I had with them, the dogs on the right side of us started to advance towards me, I didn't run, but sternly said"no doggie". They stopped in their tracks, my voice had echoed off the house, I hastily made tracks home. Shortly after this these dogs were put down as it was found they were behind the killing of sheep at a nearby farm. Obviously, this could have a much different ending, fortunately for me I adverted disaster, I still love dogs, even German Shepards. You must always respect dogs no matter their size, but especially the big ones. But I think there are a lot of people out there that just don't know what they're missing. Dachshunds would like nothing better than to be joined at your hip. I don't mind this most of the time. When I go out with the pack for our walks you definitely will know who is a dog person and who isn't. I mean I've got three Weinerdogs, any real dog lover will at least smile as they go by. You have the non-dog lovers on one end, who barely give me the space to walk, all self-absorbed staring straight ahead. Then there are those who give you a little space because then don't want to mess up their day by hitting someone. Next are people who like dogs, they may have one, who smile maybe a nod. Then we get into dog people who give you plenty of room, smile, wave maybe even a toot of the horn. The next group, plenty of room ,big smile, they slow way down so that then can admire the dogs. The last group, big smiles, stop if possible to say how much they love your weinerdogs, which you must reply "thank you". 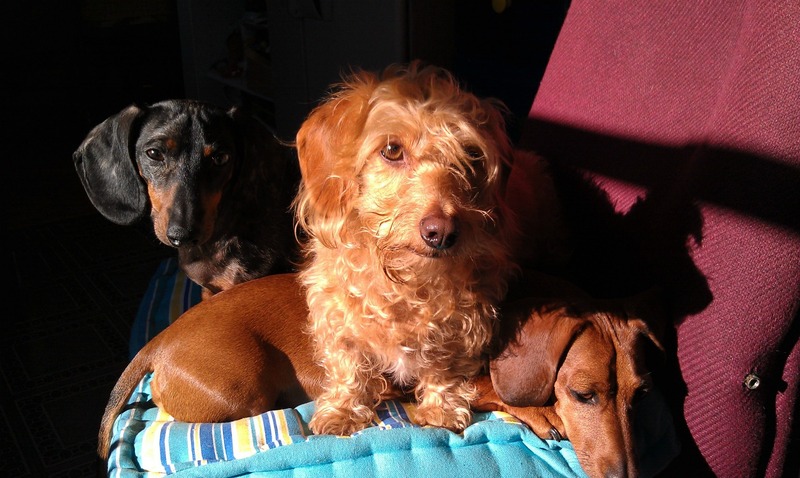 I sometimes get asked about Peaches because many people are unaware of the different coat types Dachshunds come in particularly the wirehair. Ha! they're the best! They're all great, but my two sweetest were and are my wirehairs. Watson and Peaches always so easy with the wagging tail. 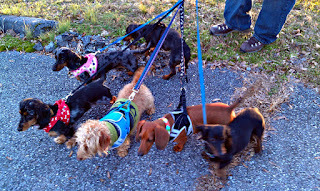 The photo above is our group from Christmas, including Spaatz, Loreli, Rupert, Peaches, Foozeball and Olivia. This walk was mostly a trail hike which the dogs love, but we had to go on the road for a little while to get back to the car. 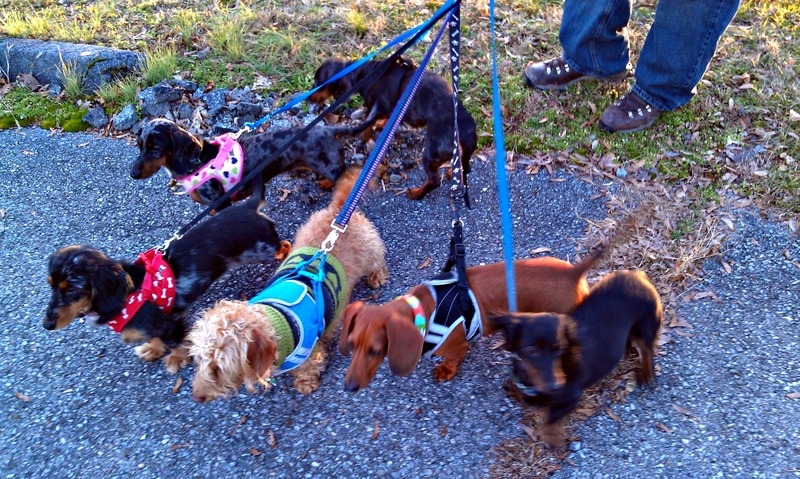 When you've got 6 Dachshunds you do attract some attention.